To my relief, I saw very little in the way of the orthography-killing cancer that is InTerCaPiTaLiZaTion while I was in Beijing. 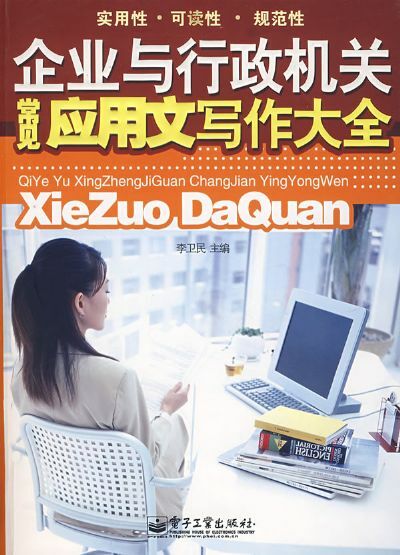 The worst offender I spotted was the cover to Qǐyè yǔ xíngzhèng jīguān chángjiàn yìngyòngwén xiězuò dàquán (企业与行政机关常见应用文写作大全 / 企業與行政機關常見應用文寫作大全), which to me just screams out “UGly NightMare”. But at least the word parsing is right, which is more than can be said for many uses of Pinyin in China. More troubling, because it is on official signage, is the use of intercaps on some station guides above the doors of subway cars. The capitalization of “Of” demonstrates that the bro-ken and InTerCaPiTaLized “Bei Jing” is probably due more to standard sloppiness than design. At least I certainly hope no one did that on purpose. 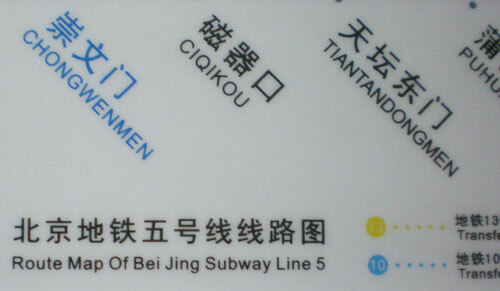 Fortunately, that usage isn’t found throughout the subway system, as this photo from a map of another line shows. 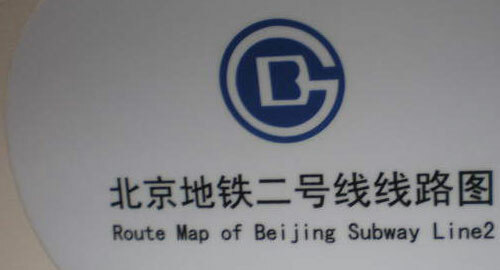 Reports of what style is to be found on other Beijing subway lines — especially the newest ones — would be welcome. 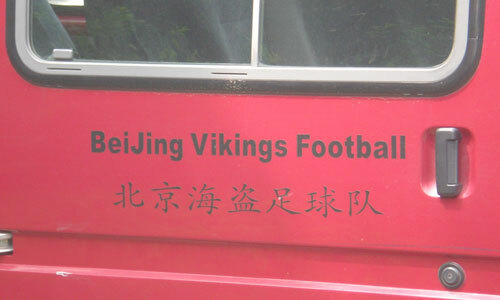 But that appears to be a one-off, since the Beijing Vikings don’t use that style on their Web site or elsewhere that I noticed. In less than seven hours I’ll be leaving on my first trip to Beijing in fifteen years … and of course I’m not finished packing yet. While I’m there I’ll of course be doing my usual thing of finding sloppy Pinyin and signage to complain about here. But I’m also hopeful that I’ll be able to pick up some more old tracts in Sin Wenz. Recommendations on where to look would be greatly appreciated. I’m certainly not expecting the Western media to start writing Tiān’ānmén (天安門/天安门) with tone marks. But its it’s not like the apostrophe is an obscure glyph to be found only in specialist typefaces that dig deep into Unicode, the sort of thing that might require an English form separate from the Pinyin one. Microsoft Word certainly isn’t helping matters, as it flags the correct form (Tian’anmen) as a misspelling but does not flag the apostrophe-less form (Tiananmen). Indeed, if you ask the program to help you with the supposedly misspelled “Tian’anmen”, it suggests “Tiananmen”. So my guess would be that the “Tiananmen” form is the result of a combination of (1) the Cupertino effect, (2) laziness, and (3) people thinking that Tian’anmen “looks funny”. And as long as I’m on this, it’s not Tian An Men, TianAnMen, Tienanmen, Tianan men, etc., either. But, no, I don’t expect this will do much good; and if I ever work myself into a case of apostrophe rage it will probably be for other names. William A. Boltz, “The Typological Analysis of the Chinese Script.” A review article of John DeFrancis, Visible Speech, the Diverse Oneness of Writing Systems. Paul Varley and Kumakura Isao, eds., Tea in Japan: Essays on the History of Chanoyu. Reviewed by William R. LaFleur . Vladimir N. Basilov, ed., Nomads of Eurasia. Reviewed by David A. Utz. “Philosophy and Language.” A review article of Françcois Jullien, Procès ou Création: Une introduction a la pensée des lettrés chinois. W. South Coblin, A Handbook of Eastern Han Sound Glosses. Weldon South Coblin. A Sinologist’s Handlist of Sino-Tibetan Lexical Comparisons. ZHOU Zhenhe and YOU Rujie. Fangyan yu Zhongguo Wenhua [Topolects and Chinese Culture]. CHOU Fa-kao. Papers in Chinese Linguistics and Epigraphy. ZENG Zifan. Guangzhouhua Putonghua Duibi Qutan [Interesting Parallels between Cantonese and Mandarin]. Luciana Bressan. 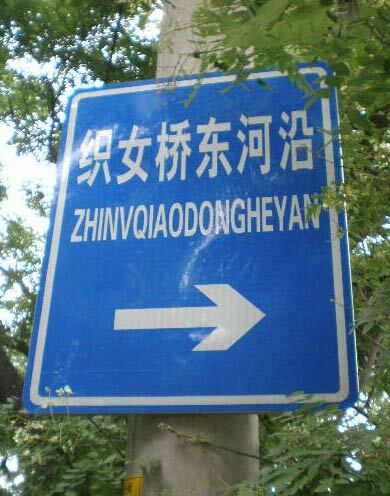 La Determinazione delle Norme Ortografiche del Pinyin. JIANG Shaoyu and XU Changhua, tr. Zhongguoyu Lishi Wenfa [A Historical Grammar of Modern Chinese] by OTA Tatsuo. McMahon, et al. Expository Writing in Chinese. P. C. T’ung and D. E. Pollard. Colloquial Chinese. Li Sijing, Hanyu “er” Yin Shih Yanjiu [Studies on the History of the “er” Sound in Sinitic]. Maurice Coyaud, Les langues dans le monde chinois. Patricia Herbert and Anthony Milner, eds., South-East Asia: Languages and Literatures; A Select Guide. Andrew Large, The Artificial Language Movement. Wilhelm von Humboldt, On Language: The Diversity of Hunan Language-Structure and Its Influence on the Mental Development of Mankind. Vitaly Shevoroshkin, ed., Reconstructing Languages and Cultures. Jan Wind, et al., eds., Studies in Language Origins. A. Kondratov, Sounds and Signs. Jeremy Campbell, Grammatical Man: Information, Entropy, Language, and Life. Pitfalls of the Tetragraphic Script. LYU Caizhen, et al., comp., Xiandai Hanyu Nanci Cidian [A Dictionary of Difficult Terms in Modern Sinitic]. 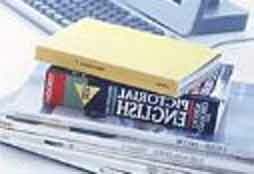 Tom McArthur, Worlds of Reference: Lexicography, learning and language from the clay tablet to the computer. JIN Shoushen, comp., Beijinghua Yuhui [Pekingese Vocabulary]. SONG Xiaocai and MA Xinhua, comp., Beijinghua Ciyu Lishi [Pekingese Expressions with Examples and Explanations] . SONG Xiaocai and MA Xinhua, comp., Beijinghua Yuci Huishi [Pekingese Words and Phrases with Explanations] . FU Min and GAO Aijun, comp., Beijinghua Ciyu (Dialectical Words and Phrases in Beijing). Paul Fu-mien Yang, comp., Chinese Linguistics: A Selected and Classified Bibliography. Paul Fu-mien Yang, comp., Chinese Dialectology: A Selected and Classified Bibliography. Paul Fu-mien Yang, comp., Chinese Lexicology and Lexicography: A Selected and Classified Bibliography. Jack Goody. The interface between the written and the oral. Jack Goody. The logic of writing and the organization of society. Deborah Tannen, ed., Spoken and Written Language: Exploring Orality and Literacy. Scott Simmie and Bob Nixon, Tiananmen Square. Thomas H. C. Lee, Government Education and Examinations in Sung China. ZHANG Zhishan, tr. and ed., Zhongguo zhi Xing [Record of a Journey to China]. LIN Wushu, Monijiao ji Qi Dongjian [Manichaeism and Its Eastward Expansion]. E. N. Anderson, The Food of China. K. C. Chang, ed., Food in Chinese Culture: Anthropological and Historical Perspectives. Jacques Gemet, China and the Christian Impact: A Conflict of Cultures. D. E. Mungello, Curious Land: Jesuit Accommodation and the Origins of Sinology. Roben Jastrow, The Enchanted Loom: Mind in the Universe. Hsu Chang-chen, ed., and tr., Yin-tu hsien-tai hsiao-shuo hsüan [A Selection of Contemporary Indian Fiction]. Hsu Chang-chen, T’o-fu tzu-huiyen-chiu (Mastering TOEFL Vocabulary). Hsu Chang-chen, Tsui-chung-yao-te i pai ke Ying-wen tzu-shou tzu-ken (100 English Prefixes and Word Roots). Hsu Chang-chen, Fa-wen tzu-hui chieh-koufen-hsi — tzu-shou yü tzu-ken (Les préfixes et les racines de la langue française). Hsu Chang-chen, comp. and tr., Hsi-yü yü Fo-chiao wen-shih lun-chi (Collection of Articles on Studies of Central Asia, India, and Buddhism). This is SPP no. 14, from December 1989. The entire text is now online as a 7.3 MB PDF. See my earlier post for the contents of the first SPP volume of reviews and a link to the full volume.